Myocarditis may present with symptoms and signs such fever, shortness of breath, palpitation, pleuropericardial pain,palpitation, arrhythmias and new onset of systolic murmur. Patient may be asymptomatic or present with symptoms and signs of biventricular heart failure. There will be hemorrhage of the ventricular myocardium. Myocarditis is due to mononuclear inflammatory infiltration which may present with myocardial necrosis and myocardial degeneration. Myocarditis may present as a result of inflammation of the myocardium of the heart. 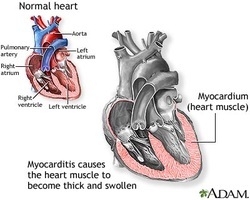 The common causes of myocarditis include, drug hypersensitivity, candida infection, sarcoidosis,Coxsackie virus B, lyme disease, toxoplasmosis, Changas disease and hyperthyroidism. Myocarditis carries a great risk of sudden death and the treatment of choice is supportive therapy/symptomatic therapy ( eg. to relieve the pain) . 1.Feldman, Arthur M., and Dennis McNamara. "Myocarditis." New England Journal of Medicine 343.19 (2000): 1388-1398. 2.Woodruff, Jack F. "Viral myocarditis. A review." The American journal of pathology 101.2 (1980): 425.